You have to provide a jolt. Armin Vit is one half of UnderConsideration, a graphic design network comprised of blogs, books, conferences, and competitions. He runs UnderConsideration with his wife Bryony from their home in Austin. We met with him to chat about what it takes to make a successful living from an online enterprise. Brand New gets 40 to 50 thousand views a day (which adds up to a nice 1.5 million page views a month). FPO (For Print Only) and Quipsologies are also daily reads for many designers. Each of the sites serve up visual entertainment in one manner or another. Brand New takes a critical eye toward corporate identity work, FPO (For Print Only) showcases great print design, and Quipsologies curates curious projects from the graphic design industry. 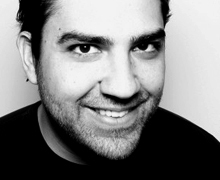 Armin has been an avid contributor to the design discourse since he launched Speak Up in 2002. It was a platform that searched for relevance in graphic design through it’s commentary on current topics. Speak Up ran its course in 2009. We asked Armin his thoughts on the state of design writing and if platforms like Speak Up are no longer the place for discourse, what are the new platforms? Designers are turning out products more prolifically than ever. At Kern and Burn we want to know what they think about what they make—the why and the how of the final piece, instead of just the polished product or application. We want to get to the heart of what makes design valuable—the design thinking and the creative process behind the work. We want to hear what makes designers proud of their work and why sometimes, design is just plain fun. There’s more to come on our chat with Armin, but for now check out all of the UnderConsideration blogs, including the most recent addition to the enterprise, Art of the Menu.